Well, we waited until Thursday, but still no invitations in the mail, so we decided to celebrate the great day in our separate ways. Barbara met up with friends, but why they had to have new dresses and hats to watch the event on TV is beyond me. Amanda and friends had a wedding barbecue at her home in the small village of Mabe just outside Falmouth. Jon and girlfriend Kathryn tried to get through to the Mall but the crowds were so immense that they settled for a side-street pub, where they watched TV with a pint. 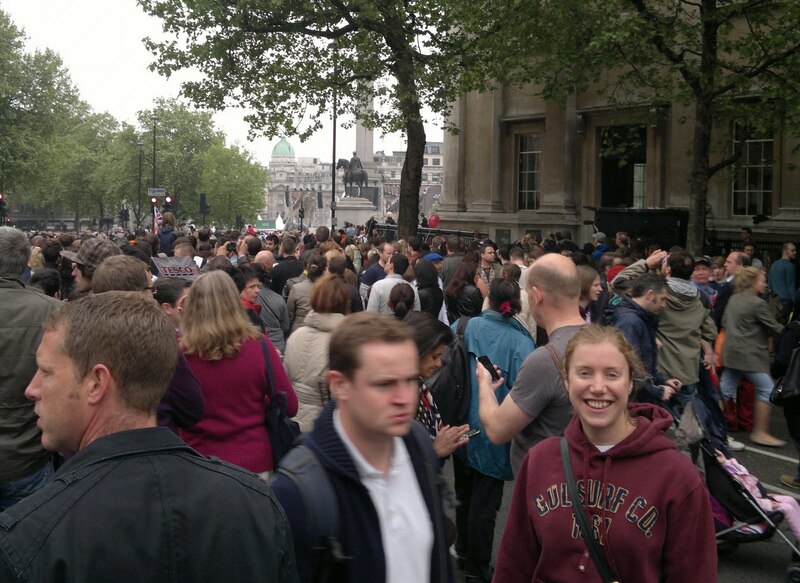 They then returned to Kathryn's flat for a good view of the Battle of Britain squadron fly-past. I was left to man the MEI office, but watched the morning's events on TV. 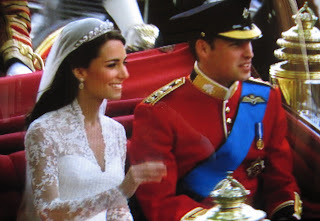 We all wish Prince William and his bride Catherine well. Despite what the grey, dreary Republicans say, the monarchy is a major part of our rich heritage and lends a splash of colour to Britain and a cynical world. So how did you spend the day? It would be particularly interesting to have the views of our friends from overseas. We are pleased to announce that Prof. Jan Miller, of the University of Utah, USA, will present a keynote lecture, entitled The continued development of X-Ray CT as an effective tool in process mineralogy at next year's Process Mineralogy '12 in Cape Town. Jan Miller is the Department Chair and Ivor Thomas Distinguished Professor of Metallurgical Engineering, College of Mines and Earth Sciences, University of Utah. He received his B.S. degree, graduating with distinction, from the Pennsylvania State University. His graduate degrees (M.S. and Ph.D.) in Metallurgical Engineering were earned at the Colorado School of Mines. He is the recipient of numerous awards based on research contributions in mineral processing/hydrometallurgy and has served on the faculty at the University of Utah for 43 years. 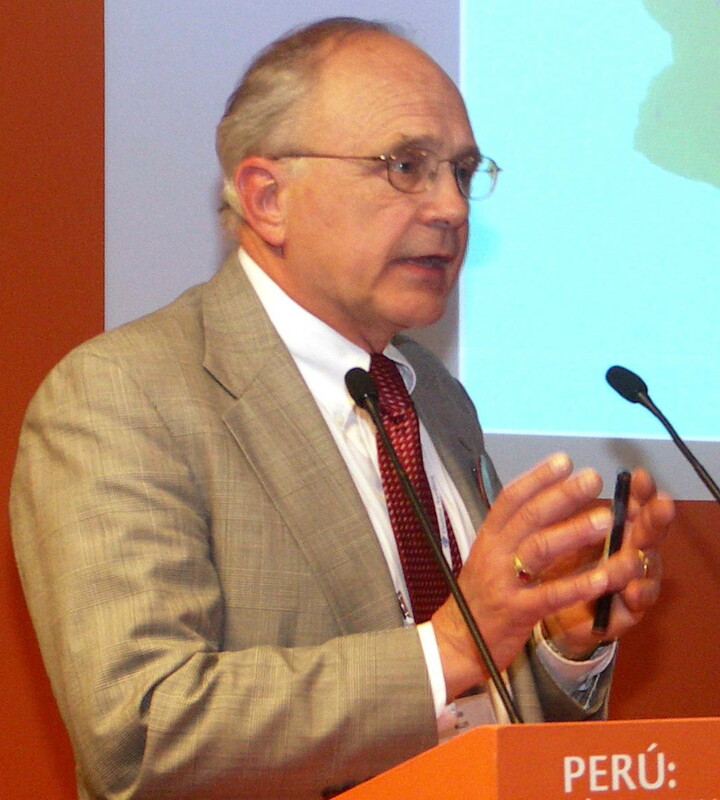 Professor Miller is a member of the National Academy of Engineering and a Distinguished Member of SME. In 2007 he received an Honorary Ph.D. degree, Doctor Honoris Causa, from the University of Pretoria in South Africa and an Honorary Professorial Appointment at Central South University, Changsha, China. More recently, in May 2010, Dr. Miller was awarded an Honorary Doctorate Degree, Doctor Honoris Causa, from Gdansk University of Technology, Gdansk, Poland. In 2011 he received Honorary Professorial Appointments at the Institute for Process Engineering, Chinese Academy of Sciences, Beijing, China and the Kunming University of Science and Technology, Kunming, China. The other keynote will be presented by Dr. Wolfgang Baum, of FLSmidth, USA. The BioMinE project is an integrated European project on biotechnologies, involving 37 companies, aimed at allowing the integration of biotechnology based processes for recovery and/or removal of metals from primary ores and concentrates and secondary metal bearing materials. The biotechnologies to be investigated will include bioleaching, biooxidation, biosorption, bioreduction, bioaccumulation, bioprecipitation, bioflotation, bioflocculation, and biosensors, as well as microbiological research. The ultimate objective will be the establishment of environmentally friendly biotechnologies that are economic, particularly at a small scale. They will provide an alternative to current technologies such as roasting and smelting. The consortium has produced a film Invisible Miners, which is an excellent introduction to the subject of biotechnology in the minerals industry. It is available on YouTube in 4 parts, Part 1, Part 2, Part 3 and Part 4. 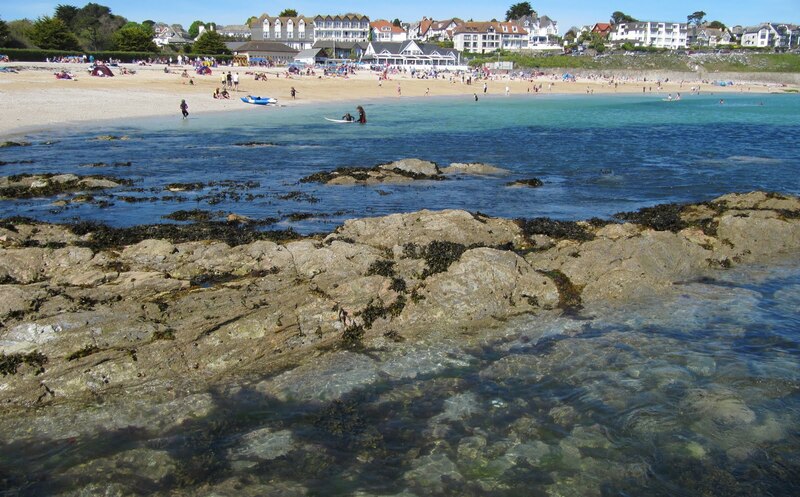 Next year's Biohydromet '12 conference will be held in Falmouth, UK, and it is hoped that work emanating from this project will be presented there. Today was a stunning day for a stroll on Falmouth's main beach, Gyllyngvase, which lies below the Falmouth Beach Resort Hotel, the venue for this summer's MEI Conferences. The photo below is looking east across the crystal clear waters of Falmouth bay to Pendennis Head, with its castle, a stop- off during the coastal walk which is a popular feature of the conferences. Pendennis Castle was one of many castles built in the early 16th Century, after King Henry VIII's divorce from Catherine of Aragon. An invasion from Spain or France, or both, was imminent so these fortress castles were built at strategic points along the south coast. 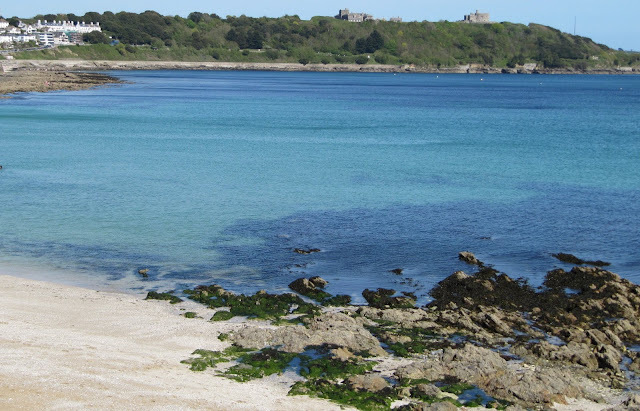 On the other side of Pendennis Head is the mouth of the beautiful River Fal, and across the river at St. Mawes is an identical castle, the two defending this important inlet to the 3rd deepest natural harbour in the world. Easter weekend, and the visitors are flocking into Falmouth, to take advantage of the early summer sun, with temperatures this week in the mid-20s. Let's hope that the weather is set fair for the three MEI Conferences which take place over the next couple of months. SRCR '11 is now only 2 weeks away, so register now if you have an interest in sustainability. The social highlight will be the conference barbecue at the iconic Eden Project. In June, Computational Modelling '11 and Physical Separation '11 will be held back to back, and the week ends with a pilgrimage to the historic Camborne-Redruth area, the birthplace of modern mining. 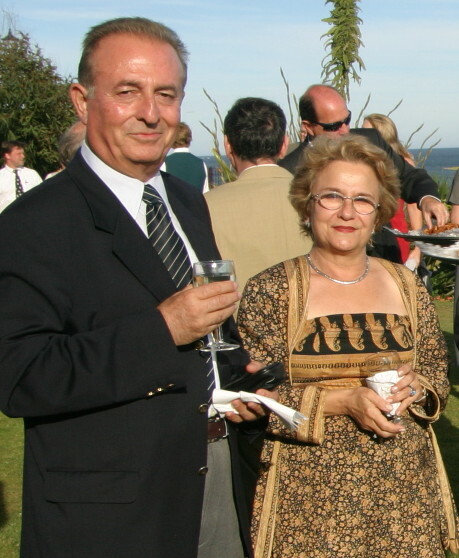 Yesterday Prof. Güven Önal, of Istanbul Technical University, emailed me with the sad news that his wife Neþe passed away on April 5th after a short illness. Güven and Neþe were good friends of ours, and we met up with them at various major conferences around the world. Neþe played an active part in the XXIII IMPC in Istanbul in 2006, for which Güven was Chairman. Neþe was a lovely lady who I am sure will be remembered with affection by many in the minerals engineering community. Our thoughts are with Güven and his family at this time. Hydrometallurgy- is it 'bucket chemistry'? Did the Ancients mine tin underground in Cornwall? Should plagiarists be named and shamed? Once again plagiarism, that scourge of journal editors, has reared its ugly head, with an accusation that a paper published in Minerals Engineering contains material directly copied from another author's work. It is evident from the comments on my recent posting on peer-review that journal referees are becoming increasingly under pressure as the flow of papers to reputable journals increases. The number of papers is increasing because researchers are also under increasing pressure to publish, as this is often the most important route to career advancement. Unfortunately this has led a minority to seek the easy route, and this is where plagiarism steps in. Fortunately, with increasingly efficient software it is becoming easier to spot incidents of plagiarism, and indeed it is often apparent just by reading papers, when for no apparent reason, the style or standard of English suddenly changes for a few paragraphs and then reverts to its original format. Duplication (sometimes called self-plagiarism) is even more prevalent. This is when an author submits essentially the same paper, sometimes thinly disguised by a change in title, or order of authors, to two or more journals at the same time. If accepted then the author's list of publications is boosted, and it is often difficult to prevent this unless there is strong liaison between journal editors. However, the author rarely gets away with this, as an eagle eye will invariably spot the duplication, maybe weeks, or even months after publication. Authors found guilty of plagiarism are often blacklisted from publication again in the journal, but the question I ask is: is this enough, or should offenders be publicly named and shamed? I seek your views on this. We are pleased to annouce that Dr. Wolfgang Baum, of FLSmidth, USA, will present a keynote lecture, entitled "Ore characterization, process mineralogy and lab automation - a roadmap for future mining" at Process Mineralogy '12 in Cape Town next year. 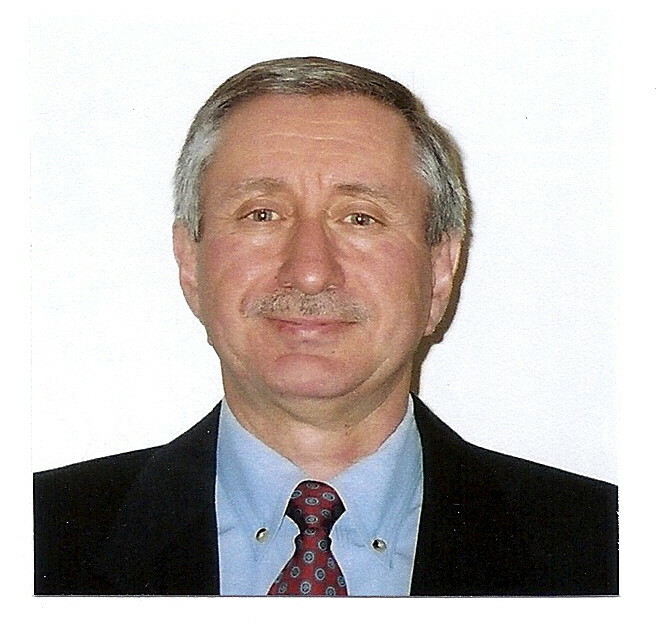 Dr. Baum has 34 years of experience as a process mineralogist in the mining industry. He has worked for Hazen Research, Texasgulf, St.Joe Minerals Corporation, and Pittsburgh Mineral & Environmental Technology. From 1999 to 2011 he established and managed state-of-the-art Material Characterization Labs at the Technology Center of Freeport-McMoRan Copper & Gold and its predecessor Phelps Dodge Mining Company including robotics lab modules for mineralogy and chemical analyses. In 2011, he joined FLSmidth as Director – Ore Characterization in Salt Lake City/Utah focusing on Process Mineralogy for minerals engineering metallurgical services and the expanded use of lab automation in mining. A very high calibre programme has evolved for next month's SRCR '11 conference, which will be held in Falmouth, Cornwall. Three keynote lectures will be given, by Dr. Terry Norgate, of CSIRO Australia, Prof. Richard Williams, of University of Leeds, UK, and Prof. Jan Cilliers, of Imperial College, UK. The conference is sponsored by Outotec. On the second evening MEI will host a conference barbecue at the iconic Eden Project, near St. Austell. We invite you to register for the conference and meet up with minerals industry professionals from around the world with interests in sustainability. It has always been thought that serious underground mining in Cornwall commenced in the 18th Century, after the invention of the steam engine, which was used to pump water from the mines. Now recent discoveries in a shallow working at the old Wheal Emmet mine near Camborne suggest that underground mining for tin may have been performed centuries before. Archaeologist Prof. Olivier Gy commented "this shallow old stope is unusually dry and has preserved ancient organic matter. Traces of dessicated pasty crust discarded by the miners have been carbon-dated to 230 A.D."
It is known that the Romans, who occupied Britain between 43 and 410 AD ventured into Cornwall for tin, which was found in streams and outcrops, but were they, or the indigenous Celts the first underground Cornish miners?